-- Why should I Purchase my new inflatable boat from SeaBright Marine? -- What is the SeaBright Marine PRICE GUARANTEE ? -- How do I Assemble my new SeaBright inflatable boat ? -- How do I Disassemble my new SeaBright inflatable boat ? -- High Pressure Airdeck Floor Vs. Sectional Aluminum Floor for my Foldable inflatable boat - Which should I choose ? -- What is the Warranty on my new SeaBright inflatable boat ? -- What is a Foldable inflatable boat ? -- What is a RIB (Rigid Bottomed) inflatable boat ? -- PVC Vs. Hypalon Fabric - What is the difference? -- How do I provide Proper Care for my SeaBright inflatable boat ? -- What Products are safe for my SeaBright inflatable boat ? -- How do I Repair a leak in my PVC inflatable boat ? -- How do I Repair a leak in my Hypalon inflatable boat ? The simple answer "Quality", "Value", and "Customer Service". You may have noticed that there are now several companies in Canada and in the US that are selling inflatable boats with what appears to be very attractive pricing. With very few exceptions these boats are manufactured using Korean or Chinese PVC. We are not suggesting that all Asian PVC is poor quality because that is not true. In fact some of the PVC from Asia is perfectly acceptable. Our SeaBright inflatable boats (from 2004 to 2007) were built using very good quality Korean PVC. This particular PVC manufacturing company was specifically recommended to us in 2004 and our overall warranty return rate with over 500 inflatable boats sold in that period was less than two percent. Unfortunately, as of August 2007 that particular company has stopped manufacturing PVC fabric. That being said it is a fact that there is a lot of very poor quality PVC that is also being manufactured in Asia. We have first hand experience with this. In 2006 we experimentally purchased a few boats made from another brand of Korean PVC. The boats looked beautiful when new but by the end of the first season of use these boats were already showing significant UV radiation damage from exposure from the sun. Unfortunately it is impossible to determine the quality of the PVC fabric in a new boat. It is the "test of time" that is the true judge. For 2008 SeaBright Marine was faced with a decision. Do we attempt to find another Asian PVC manufacturer that produces quality fabric? Since it really is a guess, we decided not to take the chance. So beginning in 2008 we decided to purchase the highest quality premium PVC fabric available on the planet today. Mehler-Valmex® PVC is produced by Mehler Texnologies in Germany and is used by most of the reputable builders of quality PVC inflatable boats in the world. For legal reasons we are not allowed to mention the names of these companies but you probably have a good idea which ones we are referring to. If you are in the market for a Hypalon boat we have pretty much the same story to tell. While it is possible to purchase Hypalon fabric from Taiwan, we opted not to do this. There are two Hypalon fabrics that are considered to be the best quality in the world. They are Achilles® Hypalon from Japan, and Pennel ORCA® Hypalon from France. All of our Hypalon boats are manufactured using one of these two Hypalon fabrics..
We honestly believe (and the vast majority of our customers agree with us) that SeaBright Marine offers the best value for your dollar in all of Canada. Our inflatable boats are custom made for us to our own specifications. At the end of each season we are busy planning enhancements and changes that we plan to implement in the following season to ensure that each year our products are just a little bit better, a little bit more functional, and a little bit higher in quality. Now that our inflatable boats are being manufactured with the same fabrics as used by most of the more well known companies out there we can say with sincerity that the quality is every bit as good as can be found in any high quality boat in the market place today. The one large difference is PRICE, and that is precisely why we sell so many boats. We listen to our customers comments. When customers ask about a feature that they would like to see we keep track of those comments and take them into serious consideration when planning our next season. We pride ourselves in exemplary Customer Service and believe strongly that this is the reason why we now get so many sales through referral of previous customers. At SeaBright Marine we believe in "the good old days" when good customer service was the norm both at the time of sale and also in the form of After Sales Support. Please take a moment to read some of our customers comments on our "Testimonials" page. We are extremely proud of this aspect of our business and firmly believe that this is the single most important reason why we are being successful. Thank you. ** Retail price means regular retail price and does not include sale pricing, inventory blow-out pricing, or liquidation pricing. • Your boat has several main inflation valves. Air can be inserted into these valves with the manual pump that is supplied with the boat, with an electric pump, or with a shop vac. • Make sure the valves are in the “closed” position before inflating the boat. They are “closed” when the valve stem is up and “open” when it is down. If you inflate your boat with the valves “open” the air will rush out when you disconnect the hose. Valves can be opened or closed by pushing on the stem and turning it a quarter turn. • If your boat is a RIB, simply install your seats and oars and inflate the tubes to proper pressure … Done ! • Inflate all of the main chambers and the inflatable keel (before floor insertion) and then open all of the valves and let the boat deflate. Don’t push the tubes down … just let the air escape normally. Make sure the inflatable keel is nice and flat (not twisted) and that the valve is in the middle. You may need to pat it down to accomplish this. This procedure is especially important with a brand new boat that has just come out of the box because the boat or inflatable keel may be twisted which will make proper floor installation difficult. • Now the boat is in its correct shape to receive the floor. • If your boat is equipped with an Aluminum Floor, install it as follows …..
o No air in tubes while installing floor and stringers. o No air in inflatable keel while installing floor and stringers. o Install piece number "1" into the nose of the boat (number up). Make sure that you push it as far forward as possible and that it is down below the tubes. o Install the rear most piece, making sure it is down below the tubes and the rear edge is under the wooden “hold down” strips that are attached to the transom. o Now keep installing pieces to the front and the rear until you meet approximately in the middle of the boat. o In order to get the last tongue into the last groove you will need to pull them both up about 10 inches. Fit them together so that you have a raised “tent” and then push them both down so that the floor is flat. Although this is possible with one person it is much easier with 2 people …. One on each side of the boat. As you are pushing these last 2 pieces down make sure you are not “pinching” the tubes and that the valve covers are not trapped beneath the floor. o At this point use your fingers to make sure the gap between the tubes and the edge of the aluminum floor is the same on both sides. If it isn't then it will be difficult to install the stringers properly. o Install the stringers onto each side of the floor. They need to be installed so that they overlap the joints of the aluminum floor pieces. This is what will provide stability. If there are 4 stringers with your boat then you need 2 on each side and there should not be any gap between them. Only the aluminum pieces need support …. Not the wooden floor piece(s). o Stringer installation requires that the boat is on a flat surface. If the surface is not flat or if you are having difficulty installing the stringers it may help to put a 2 x 4 under the edge of the floor (on its edge). Do one side at a time. This will flatten the floor on that side and will also let the tube “fall away” slightly which will result in a slightly larger gap and easier stringer installation. o Take a wet towel and “wet down” the tube and the stringer. This will decrease friction. Now install the stringer be “curling” it in. Large flat side needs to be down. o Unpack the boat and unroll it on a flat surface. o Inflate all four chambers before installing the floor. Inflate the inflatable keel. Now open all five valves by depressing and twisting a quarter turn (4 main Chambers and the keel) and let the boat deflate. Pat down the inflatable keel so that it is nice and straight and not twisted. Now the boat is ready for the floor. o Take a bucket of water and pour into the boat making sure the entire hull skin is wet (or use a garden hose). o Install the front three floor pieces. Install the rear 3 floor pieces. Make sure that these six pieces are all below the tubes and in their proper position. o Now install the middle piece. You will need to tent up two pieces. Now get inside the boat press down make the floor flat. This is much easier with two people because if you are not careful at this stage you can pinch the PVC fabric. As one person watches the edges for pinching the second person should stand on the tent and bounce up and down. The tent will slowly go down until floor is flat. o Now it is time to install the stringers. o While one person holds up one side of the boat by pulling up on the ropes place an 8 foot 2 by 4 under the boat. It should be on its edge and should be about three or four inches inside the aluminum floor. This will result in the tubes falling slightly away and the gap where the stringers need to go will get a bit larger. o There are four stringers. Two are short and two are long. Each side of the boat needs a short and a long stringer. Stringers are designed to hold the floor rigid while going over waves and it is important that each aluminum floor joint is supported by at least 10 inches on each side. Before installing stringers place them on the floor and decide where you want them. o Get inside the boat. Then use water to wet down PVC tube where the Stringer will be installed and also the stringer itself. o It is very important that the panels onto which you are installing a Stringer are completely flat with each other. The person inside the boat should use his weight to make sure the 2 panels (or 3) that are receiving the stringer are all flat. o While the person outside of the boat pulls of the tube away to make a the gap larger, the person inside the boat curls a Stringer into place. o Now do the same with the second Stringer on that side. o Remove the 2 by 4 and a place under the boat on the other side. Follow the steps above to install the two stringers on that side. • If your boat is equipped with a High Pressure Airdeck Floor, install it as follows …..
o Place the deflated airdeck floor in the boat with the floorboard underneath. The floorboard is in a sleeve and its primary purpose is to keep the floor flat when the keel is inflated. The easiest way to install the airdeck is to press the floorboard down under the 2 tubes at the very rear of the boat because this is where the boat is the widest. Now get into the boat and gently pull the floor forward making sure that the keel board stays securely under the 2 tubes. Do not apply great force. If the floor will not move forward then inspect it to see where the "bind" is. After you install the floor 2 or 3 times it will be easy. When you can see the inflatable keel valve through the "hole" at the front of the floor then you have pulled it forward far enough. The rear of the floor should now be almost touching the transom. Now walk around the boat tucking the floor down underneath the tubes. 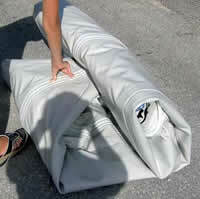 o It is time to inflate your airdeck floor. You want the floor to be hard enough so that you can walk on it without sinking in very much. Don’t be afraid to put lots of air into it. A good indication that it is inflated properly is when it becomes difficult to push down on the plunger handle of your pump. • If you want the seats installed, install them now. *Note* It is not necessary to install the seats if you prefer to run without them. • Now you can inflate the main tubes. They should be fairly hard to the touch, and you should be able to sit on them without sinking into them more than an inch. **NOTE** Inflate the main compartments in a 2 or 3 step sequence. If you fully inflate one main compartment when the others are empty you may damage the internal bulkheads that separate the compartments. • Finally it is time to inflate the keel. The valve should be clearly visible and should be pretty much in the middle of the hole in the front of the floor. The boat will rise as you inflate the keel. The keel should be harder than the tubes. A good indication that it is hard enough will be when the pump handle is beginning to be difficult to push down. • Install the oars, put in the valve protectors, and you are ready for a day on the water. Enjoy! • The valves should be in their "closed" position prior to inflation. They are closed when they are popped up. If you push the valve down and give it a quarter turn it will stay down in the "open" position. Do this when you wish to deflate the boat. If you inflate the boat with the valve in the "open" position the air will rapidly escape as soon as you remove the pump. • It is not recommended that you use a compressor to pump up your boat. Compressors are designed for very high pressures and you could easily damage the boat. • If you have access to electricity one of the easiest and quickest ways to inflate (or deflate) your boat is with a "shop vac". Give it a try. It really works great. You will need to have the valve down in the "open" position to use a shop vac. Be ready to very quickly pop the valve back up into the "closed" position when you pull the shop vac nozzle away to prevent the air from escaping. • If your boat isn’t “planing” properly or seems to be too “flexible” when under power it is probably under inflated. If your boat is equipped with a High Pressure Airdeck Floor and/or an inflatable keel, they should be fairly hard, and the tubes should be hard enough that you can sit on them without depressing them more than an inch..
• If your boat is equipped with an Aluminum Floor, It is highly advisable to assemble your aluminum sectional floor for the first time outside the boat in order to learn how it all goes together. After you are familiar with how the floor pieces and stringers all fit together it will be much easier to assemble it properly when doing it inside the boat. What is the Black Valve ? The black valve that is located in the front chamber (2 front chambers in the SeaBright 420P and the SeaBright 500P) is a high pressure safety release valve that will release some air if the boat becomes over pressurized, thereby ensuring that the seams do not get damaged. It is automatic and there is nothing you need to do to this valve. If your boat is a RIB, deflate the pontoons using a vacuum cleaner or a 12-volt electric pump. Leave a very small amount of air in each chamber will ensure that the fabric is relaxed and not too severely scrunched. Close the valves and install the valve protector caps. **Hint** A shop vac does an excellent job. You are finished and can disregard the remainder of this section. If your boat is a Foldable Inflatable Boat, use a vacuum cleaner or a 12-volt electric pump to deflate the inflatable keel. Close the valve and install the valve protector cap. **Hint** A shop vac does an excellent job. If your boat is equipped with an Aluminum Floor, it is now time to remove it. Remove the “stringers” from either edge first. Now, lift the floor about 10 inches at the rear most seam (between the last and second last floor pieces). Carefully lift the pieces out and place them in their carrying case. If your boat is equipped with a High Pressure Airdeck Floor, remove the air from it and install the valve protector cap. It is not necessary to remove the floor from the boat unless you wish to clean the boat at this time. Deflate the main pontoons. As they are deflating pull up on the side ropes so that the boat will fold in properly. You want the pontoons to fold in so the entire package is not wider than the transom. It is a bit tricky the first couple of times. If the pontoons are not folding in properly then put a bit of air back into them and repeat the deflation procedure until you achieve the desired result. Now open all main valves to let a small amount of air in. Leaving a very small amount of air in each chamber will ensure that the fabric is relaxed and not too severely scrunched. Leave the valves open for the remainder of the process. Put the boat and its accessories into the carrying case. The valves should be in their "open" position for disassembly. They are open when they are in the “down” position. They can be alternately placed in their up (closed) and down (open) positions by pushing them down and turning one quarter turn. Make sure that each chamber in your boat has a very small amount of air in it to prevent severe “scrunching” of the fabric so that damage doesn’t occur while your boat is being stored. SeaBright Foldable inflatable boats are available with either a high pressure Airdeck floor or a sectional aluminum floor. Boats ranging from the 7.5 foot SeaBright 230 to the 12.5 foot SeaBright 380 are available with either floor. The 13.8 foot SeaBright 420 and larger models are only availaible with the sectional aluminum floor. • highly recommended for all models larger than the 8.9 foot SeaBright 270, especially if you wish to "plane" your boat at higher speeds. - if your boat is not larger than the SeaBright 270. - if your boat is larger than the SeaBright 270 but will only be rowed or used with an engine that is too small to “plane” the boat. - If you are concerned about overall boat weight. - if your boat is larger than the SeaBright 270 and you wish to operate it at higher “planeing” speeds. - if you have a large dog whose claws may puncture the high pressure airdeck floor. - if you will regularly have sharp objects on the floor of the boat. For warranty information related to boats purchased from 2004 to 2018 please contact us for details. • This warranty pertains only to new SeaBright Boats that are purchased since Jan 1, 2019. If boat was purchased prior to 2019 please inquire for warranty details for your boat. • SeaBright Marine Ltd. warrant that each new SeaBright inflatable boat and accessories attached thereto (hereafter referred to as “Product”) will be free from defects in workmanship. We also warrant that an acceptable grade of materials has been used in the construction of the product as to cause the product and all associated components of the product to perform to expected and reasonable service levels during the warranty period. • This warranty shall remain in effect as described below. o Tube Fabric ( PVC or Hypalon) is covered by a 7 year warranty against delaminating, cracking, rot, and UV radiation damage. Years 6 and 7 will be pro-rated based upon current value of the boat. NOTE: This warranty applies to boats sold within Canada. Boats sold outside of Canada have a fabric warranty of 5 Years. NOTE: Delaminated is determined to have occurred when the outer coating separates from the fabric base or the fabric loses its structural strength or if air leakage occurs through the fabric. NOTE: UV radiation damage is determined to have occurred when fabric has discoloured and become sticky to the touch. o Seams are covered against air leakage by a 3 year warranty. NOTE: This warranty applies to boats sold within Canada. Boats sold outside of Canada have a seam warranty of 2 Years. o Floor Fabric ( PVC high pressure airdeck floor) is covered by a 2 year warranty against delaminating, cracking, rot, and UV radiation damage. o All other product parts that are part of (or attached to) the boat, including but not limited to components such as oar locks, oars, lifting handles, transom holders, transoms, “D” rings, stringers, aluminum floors, fibreglass hulls, valves, etc. are covered by a 2 year warranty. o All products that that are not part of (attached to) the boat, including but not limited to pumps, boat covers, launch wheel kits, seat covers, etc. are covered by a 1 year warranty. • This warranty applies to defects in material and workmanship, and also ensures that construction materials are of adequate quality. It does not apply to normal wear and tear, or to damage caused by. o Neglect, lack of maintenance, accident, puncture, abnormal operation or improper assembly. o Use of accessories or parts not sold by, or ratified by SeaBright Marine Ltd.
o Use of any cleaner and/or protectant that is not approved and recommended for use on materials used in the construction of the product. o Participating in or preparing for racing or other competitive activity. o Alteration or removal of parts. o This warranty does not cover incidental or consequential costs or expenses such as: haul–out, launch, towing transport and storage charges, shipping, telephone or rental charges of any type, inconvenience, or loss of time or income; or other consequential damages. o Warranty is Void on the bottom of the boat (the part of the boat that is in the water) if marine growth (mussels, barnacles, etc.) is allowed to grow. If the boat will be in the water for extended periods of time the customer is advised to apply an approved and recommended product that is designed to eliminate marine growth. • Customer must provide reasonable access to the product for warranty service by delivering the product for inspection to SeaBright Marine Ltd or to a dealer authorized to service the product. SeaBright Marine Ltd. shall then arrange for inspection and repair, provided such service is covered under this warranty. Purchaser shall pay for all related transportation charges and/or any other expenses associated with that service. • Our obligation under this Warranty shall be limited to repairing a defective part, or at our option, refunding the purchase price or replacing the product or such part or parts as shall be necessary to remedy any malfunction resulting from defects in material or workmanship as covered by this Warranty. • We reserve the right to improve the design of any product without assuming any obligation to modify any product previously manufactured. • All incidental and consequential damages are excluded from this warranty. Implied warranties are limited to the life of this warranty. A Foldable Inflatable Boat is exactly what it sounds like ….. foldable. When not in use it can be disassembled and packed into carrying cases for easy transportation. The hull of the boat is made from the same fabric that the tubes are made from. 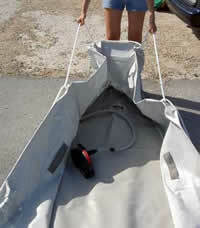 All SeaBright “foldables” are equipped with inflatable keels that when inflated stretch the hull into a nice tight “V” shape to provide tracking stability when towing, rowing, or when carving around corners with an outboard engine. The bottom of each tube and the bottom of the “V” have extra protection to provide extra durability. All SeaBright foldables come equipped with either a high pressure airdeck floor or a sectional aluminum non-skid floor. 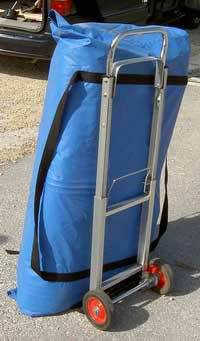 • Easy transportation because it can be folded and stored in carrying cases. Rigid Bottomed Inflatable Boats (RIB’s) have a rigid hull that is usually made from either fibreglass or aluminum. All SeaBright RIB’s have fibreglass hulls. The inflatable tubes are attached to the hull around the edges to provide stability and buoyancy. Since the hull is rigid these boats cannot be folded and put into carrying cases. They can be made slightly smaller by deflating the tubes but generally need to be transported on a trailer. At SeaBright Marine we offer both Single and Double hulled RIB’s. A single hulled RIB has a single thickness of fibreglass shaped into a “V” for trackability. When you are inside one of these boats you will notice that the floor is also “V” shaped. Single hulled RIB’s are extremely popular because of their relative lightness. A double hulled RIB has 2 distinct thicknesses of fibreglass. On the bottom it has a distinct “V” shaped fibreglass hull. Inside the boat is a flat floor. Since there is significantly more fibreglass in a double hulled RIB these boats are significantly heavier than their single hulled counterparts. • Very efficient – requires less power to achieve “plane”. • Since the hull is rigid there is absolutely no “flex”. • Floor does not need to be installed when assembling boat. Con-- won't last as long in the direct sunlight as Hypalon before it starts to break down (if left unprotected). Con-- does not tolerate gasoline spills as well as Hypalon. Pro-- will last significantly longer than PVC when exposed to prolonged periods of direct sunlight. There is no doubt that PVC fabric won’t last as long as Hypalon fabric if the boat will be subjected to prolonged periods of direct sunlight and no measures have been taken to protect the PVC fabric from the sun (i.e. boat cover or UV spray). After a number of years in direct sunlight the PVC fabric will become sticky. After that it will become crusty and discoloured. Finally it will crack and begin to leak. 1) This is not a problem unless your boat is going to be outside and unprotected all summer, every year. If you only use the boat occasionally such as on weekends or while on vacation then it isn't a factor at all. Even if you leave your boat outside all the time the issue can be solved by putting a sun/rain cover on your boat when it isn't in use or by applying a UV protective spray periodically (such as AeroSpace 303 Protectant). 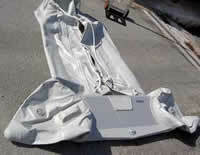 Any inflatable boat dealer (including us) can sell you a cover that is designed to fit your boat. If you are willing to take the necessary steps required to protect your PVC boat then you can take advantage of the significantly more attractive pricing points that we are able to offer with our PVC boats. 2) Keep in mind that the 2 most well known inflatable boats sold in Canada (for legal reasons we cannot name them here) are PVC boats. Both of these dealers also offer Hypalon boats but the vast majority of the boats that they sell are PVC. 3) Hypalon inflatable boats are significantly more expensive. On average a Hypalon inflatable boat will cost you 50 to 75 percent more than a PVC inflatable boat that is comparable in size and equipment options. However, if the intended use for your boat will involve long periods of exposure to sunshine and if you are not inclined to cover or protect the boat when it isn’t in use then perhaps the added expense associated with a Hypalon boat will make practical sense for you. • Please note that as of 2008 all of our PVC boats are being manufactured with genuine Mehler-Valmex® PVC from Germany. Mehler-Valmex® PVC is widely regarded in the industry as being the premium quality PVC fabric available in the marketplace today, and is the PVC fabric of choice for most high quality inflatable boat companies. • Please note that as of 2008 all of our Hypalon boats are being manufactured with genuine Achilles T10® Hypalon from Japan or genuine Pennel ORCA® Hypalon from France. These 2 Hypalon fabrics are widely regarded in the industry as being the premium quality Hypalon fabrics available in the marketplace today, and are the Hypalon fabrics of choice for most high quality inflatable boat companies. Whether you ultimately choose a PVC inflatable boat or a Hypalon inflatable boat, you can be sure that SeaBright Marine Ltd has the boat to serve your needs. We are confident that after you do your research you will agree with us that in each case our products represent the best value in Canada. Taking care of your SeaBright inflatable boat is easy. Keep your boat clean and free of debris and grime. Check the bottom regularly to make sure there is no excessive build up of marine life. With this in mind, We recommend that you cover your boat when it will not be in use for extended periods of time. While we realize that it is not practical to cover your boat every time you get out of it, if the boat is not going to be used for several days it is advisable to cover it. Temporary protection from the sun can also be achieved by applying AeroSpace 303 Protectant® or Aurora Polyguard®. These products are very effective but must be re-applied periodically in order to maintain their effectiveness. Sunscreen - from the arms and legs of your passengers can be harmful to PVC fabric. Care should be taken to ensure that sunscreen is washed off of the boat promptly. Applying Aurora Polyguard® to your inflatable boat will protect it from damage due to sunscreen. 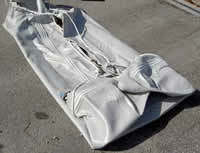 Fuel Spills and Engine Exhaust - can damage the fabric of your Inflatable Boat. Take care to clean up fuel spills promptly if they ocurr. If using a davit system you should position your Inflatable Boat so that it will not be subjected directly to exhaust fumes. 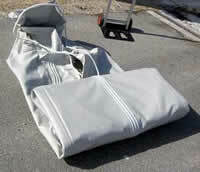 If you have a foldable inflatable boat remove your high pressure air floor or sectional aluminum floor. You will need to partially deflate the boat to get the floor out. Reinflate the boat without the floor installed. Wash your entire boat with warm soapy water or a boat wash product that is approved for use on the fabric that your boat is made from (PVC or Hypalon). Allow the boat and accessories to dry thoroughly. It is not necessary to store the boat deflated. If space is not an issue it is perfectly fine to leave your boat inflated during off season. Your boat should be clean and dry. It is not necessary or store your boat in a heated area. Make sure that your boat is not stored "wet", especially if it will be subjected to freezing conditions during storage. Freezing and thawing water can damage the seams of the boat. Never use any product that contains silicone on your inflatable boat, such as "Armor All®". Applying silicone to your boat will make it extremely difficult in the future to apply a patch to your inflatable boat should it ever need repair. Even years later it will be difficult to successfully apply a patch. Do not use any product on your inflatable boat that is not approved for use on the fabric that your boat is made from (PVC or Hypalon). When in doubt check with the product manufacturer to make sure that the product will not harm the fabric. Always make sure that the product does not contain silicone. Here is a list of products that we recommend for use on your SeaBright Inflatable Boat. None of these products will damage your boat or inhibit the ability to apply patches to your boat should it be necessary at a later date. Protects fabric from "color fade"
Protects PVC fabric against damage caused by sunscreen from the arms and legs of your passengers. allow a minimum 24 hours to cure. Failure to follow this guideline may make it difficult to apply a repair patch in the future should the need arise. Small repairs and the addition of small accessories may be attempted by the owner if factory gluing instructions are followed closely. Rips or holes larger than one inch in the air chambers or within two inches of a seam should be repaired with internal and external patches by a professional repair technician at a certified repair facility. Glue: Your boat came equiped with a tube of one part PVC glue. This glue will work well for very small holes (pin holes) but for larger holes or seams you should use two part PVC glue. Do not use glue that is not specifically intended for PVC fabric. Hypalon glue will not bond properly with PVC. Humidity: Humidity must be less than 70%. Temperature: Do not glue in direct sunlight. Temperature should be between 64 and 77 degrees F.
Gather rags, glue brush; solvent; timer with second hand or stop watch; make sure all the old glue is cleaned off; get your patch cut out, position noted and marked. It always leaves a neat tidy finish if you tape off the perimeter of the patch area with masking tape to avoid over glue. If using a 2 part glue, mix accelerator and glue thoroughly either now or while waiting between the solvent wipes below. Accelerator is toxic; keep off skin. Keep mixed glue covered (foil or wax paper) when not using. Pot life is about 1 hour. It may still look liquid, but will have lost effectiveness. Apply two more solvent wipes with 5 minute waiting time (timed) between them. You are preparing the fabric for glue adhesion. Abrading these PVC fabrics is not recommended or necessary. Apply a thin glue layer with stiff brush to both sides. Aggressively work it into the fabric with the brush. If it looks too thin, it is probably correct! Wait five minutes (timed) If glue still looks wet, wait longer. Wait 10 minutes after third layer of glue. Join the surfaces during the next 10 minutes. Start from one edge and slowly lay the patch or accessory down onto the glued area. Press out all air bubbles and wrinkles from the center to the edges. On deflated boat rub as hard as possible with smooth tool, e.g. the back of a large tablespoon - force air out from between boat and patch. Careful not to scratch the fabric. Wait at least 48 hours before use. Pressure test if you want to be sure. Blow it up to full pressure. Leave it overnight. Never fiddle around with these. Bond strength drops very rapidly with heat or high humidity. Take your boat indoors. Don't even think about trying to glue on the dock or near the water or in direct sunlight. Professionals use a specially built, climate controlled room, and still don't attempt to work on a rainy day. Note (when using a 2 part PVC glue): The solvents in the glue must evaporate before assembly. When ready to assemble parts, the glue must not be tacky at all to the finger. It must not have spots of whitish glaze. If so, you may have spread the glue too thick, not waited long enough between coats, or a sudden drop in temperature or gust of humid air may have occurred. Someone may have opened the door, or you may have leaned too close and breathed on it. Plan to stay in the room until finished. If using small cans ( 1/4 L) mix the entire can with the dose of accelerator. Inaccurate measurement will weaken the glue. Once opened the accelerator cannot be kept. Do not try to save it. The quality of your final bond depends on it. Old glue must be completely removed -- solvent, sandpaper, scraping, grinding with a Dremel tool. Glue will not stick to old glue. Clean it off thoroughly. Be careful not to burn or melt the fabric if using a Dremel tool. Constant motion with the tool will prevent this problem. If your boat has ever been protected with ArmorAll® or another silicone or petroleum based product, you may have great difficulty getting a bond. Wipe the repair area well with MEK, follow the gluing instructions closely and hope for the best. Use in a well ventilated area. Fumes can be overwhelming. A carbon filter respirator is recommended. MEK solvent smells, but is relatively safe. It is recommended that you not use Toluene - the factories do but it is quite dangerous. Always wear safety gear as recommended by the manufacturer of glue, solvent, accelerator, etc. Recommended solvent: The solvent used at the factories is called Toluene or Toluol. It is often available at paint, hardware or plumbing stores as a cleaning solvent. You can also use MEK (methyl ethyl ketone). It is often available at paint, hardware or plumbing stores, sold as a cleaner for PVC pipes or lacquer thinner. For non-critical bonds you might substitute acetone. Glue: Your boat came equipped with a tube of one part Hypalon glue. You can also use Zodiac #7097 Universal Glue, Avon Adhesive (one or two part), Bostik® or other Hypalon or rubber glues. Do not use glue that is not specifically intended for Hypalon fabric. PVC glue will not bond properly with Hypalon. *** NOTE *** IN ADDITION: you must abrade/scuff the fabric to remove any oxidation and to allow the glue to attain a mechanical bond to the scuffed area. Use 100 grit sandpaper or a Dremel tool. Do not cut into the threads under the protective coating. You just need to cut through the surface to allow the solvents and glue to penetrate. Some accessories rubber surfaces have been preprocessed and do not need abrading, rub just the boat fabric. Wipe clean to remove grit and residue. Apply one more solvent wipe with 10 minute waiting time (timed) between them. You are cleaning the fabric for glue adhesion. Wait 20 minutes (timed) If glue still looks wet, wait longer. Check for no tackiness with knuckle, no adhesive should stick to your skin. Humidity control while glue is drying is critical. Keep door closed. Don't breathe on glue area while inspecting. Wait 10 minutes after second layer of glue. After 10 minutes, join the parts together. Start from one edge and slowly lay the patch or accessory down onto the glued area. If over 10 minutes or if glue has spots of white haze the glue has picked up moisture and you should try to "reactivate" it. With a clean rag wet the glue surface with MEK but do not rub the glue off (one quick swipe). Then assemble immediately. Press hard. For accessory on an inflated boat you can rub it down vigorously with a rag with MEK on it. Note (when using a 2 part Hypalon glue): The solvents in the glue must evaporate before assembly. When ready to assemble parts, the glue must not be tacky at all to the finger. It must not have spots of whitish glaze. If so, you may have spread the glue too thick, not waited long enough between coats, or a sudden drop in temperature or gust of humid air may have occurred. Someone may have opened the door, or you may have leaned too close and breathed on it. Plan to stay in the room until finished. Pinhole size leaks in most Hypalonfabric or PVC boats sometimes may be repaired simply by use of either Seam Seal or Air Seal liquids. You might be able to avoid a patch on the boat.